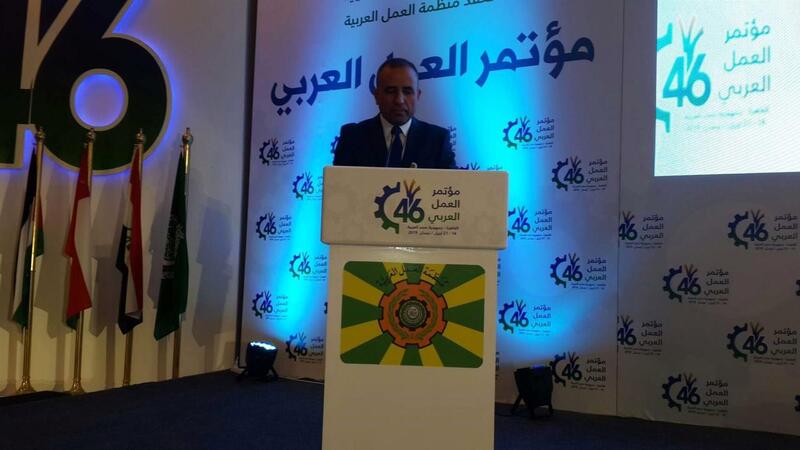 Iraq participated Sunday in the 46th session of the Arab Labor Conference in Cairo, Egypt. The Minister of Labor and Social Affairs, Basem Abdul Zaman, headed the delegation of Iraq participating in the work of this session with the participation of representatives of the three parties of production (governments, employers and workers' representatives) from 21 Arab Labor Organization members in the presence of Arab and international figures active in the field of economic and social development. The agenda of the session includes two technical items. The first is to discuss the report of the Director General of the Arab Labor Office and the second is related to the decisions and recommendations of the Board of Directors of the Organization, as well as a detailed report on the progress made in the Arab Employment Decade and the regular committees of the Organization for Freedom of Association, Legal Experts and Arab Women's Affairs. On the unification of Arab visions, the conference will discuss the memorandum of the Director General of the Arab Labor Office, which will be presented during the 108th session of the International Labor Conference to be held in Geneva in June 2019. The conference will also discuss the strengthening of the role of the blue economy to support employment opportunities and the role of modern technology in the integration of persons with disabilities in the labor market and the appointment of the Director General of the Arab Labor Organization for the period 2019-2023. The Minister of Labor and Social Affairs Bassem Abdel-Zaman arrived in Cairo on Saturday to participate in the 46th session of the Arab Labor Conference. Iraq participated Wednesday in drafting the provisions and resolutions of the 46th session of the Arab Labor Conference held in Cairo, Egypt. 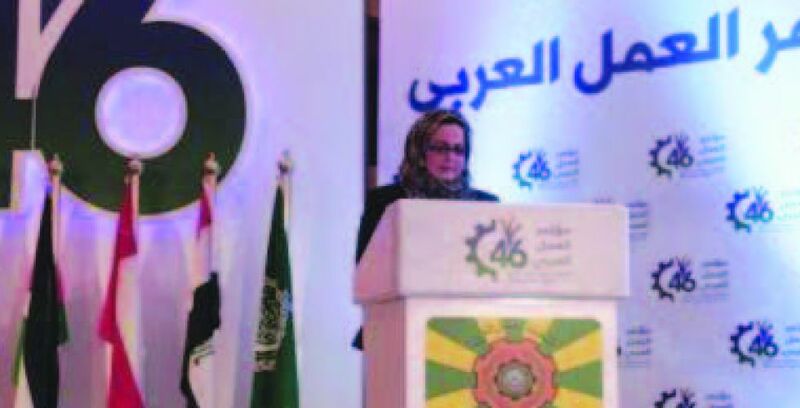 The Ministry of Labor and Social Affairs, in a statement received by Mawazine News, said that "the participants in the work of the 46th Session of the Arab Labor Conference completed the topics on its agenda on Wednesday 179401." 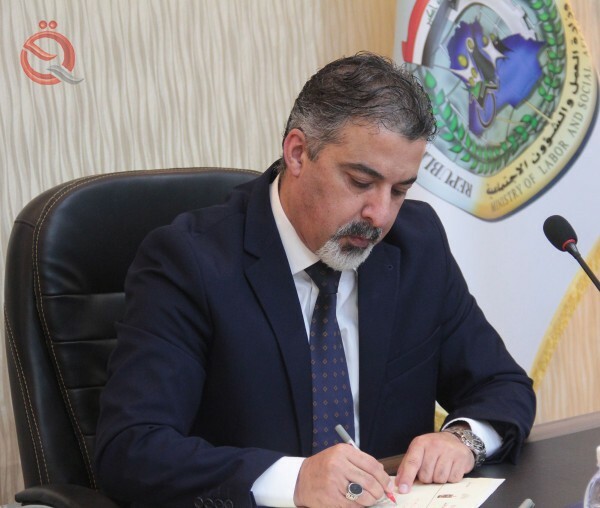 The statement added that "the Director General of the Legal Department of the Ministry of Labor and Social Affairs Ahmed Al-Bora was chosen as Vice-Chairman of the Drafting Committee of the Conference and the member of the drafting of the resolutions that he issued." He pointed out "the election of the Director General of the Arab Labor Organization, Fayez Al-Mutairi, In addition to honoring the sixth constellation of 24 Arab Labor Leaders from 15 Arab countries. The Arab Labor Organization has been honored every three years for honoring the pioneers of work from the three production parties in the Arab countries since the Arab Labor Conference adopted it in its 30 th year 2003 ". He pointed out that "the current session witnessed a number of important topics, headed by the Director General of the Arab Labor Office, Fayez Al-Mutairi, entitled" Labor Relations and the Requirements of Sustainable Development ", to boycott the future of the Arab labor markets and the reality of the labor force. In achieving the plans and visions of sustainable development in the Arab countries in an integrated and effective manner. " The second item was entitled "The role of modern technology in the integration of persons with disabilities into the labor market", and reviewed "a number of items to be submitted" Reports on the activities and achievements of the Organization, its Board of Directors, the regular committees on freedom of association, legal experts and Arab women's labor affairs, and the Committee on the Application of Conventions and Recommendations, with a view to unifying Arab attitudes and visions, as well as the memorandum of the Director General of the 108th session of the International Labor Conference. The Ministry of Labor and Social Affairs revealed on Tuesday that Iraq has the presidency and membership of the Organizing Committee of the Arab Labor Conference, which started its 46th session and continues until 21 of this month in the Egyptian capital Cairo. A statement by the ministry, received by «morning», that «Iraq got the presidency and membership of the Organizational Committee, represented by the Director General of the Department of Planning and Studies in the Ministry of Labor, as well as membership of the decision-making committee among the main committees of the Arab Labor Conference». The statement added «Iraq has also obtained the membership of a number of committees in the conference, including technical and other Committee on the application of standards, conventions and recommendations and the Information Technology Commission for the disabled, as well as the Finance Committee and the strengthening of the role of the blue economy to support employment opportunities and labor relations and the Committee on Labor Relations and Sustainable Development, The labor market and keep pace with technological and cognitive development ». The conference discussed a number of important topics, particularly the report of the Director General of the Arab Labor Office entitled "Labor Relations and the Requirements of Sustainable Development", as well as the review of two technical items, the first on enhancing the role of the blue economy to support employment opportunities; In the integration of persons with disabilities into the labor market. "